The Five are finally home! Cuban and American revolutionaries have struggled for justice from the beginning. 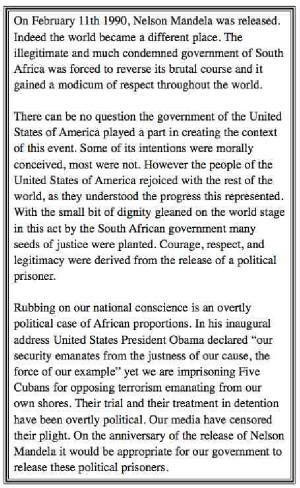 Join the campaign to Free the Five Cubans imprisoned in the USA for their efforts to prevent terrorism. NO to another WAR! The offensive measures taken by the United States Government against the country of Syria represent the most serious crime one country can commit against another. Every effort must be taken to decry this indignity. The honor peoples of the United States of America made so many sacrifices to own is at stake. NO to WAR. Discharge the criminal authors of this heinous crime. Write to Condoleezza Rice and Alberto Gonzales and demand freedom for the Five. Click here for two draft letters to send! On February 11th 1990, Nelson Mandela was released. Indeed the world became a different place. The illegitimate and much condemned government of South Africa reversed its brutal course and immediately gained respect throughout the world. There can be no question the government of the United States of America played a part in creating the context of this event. Some of it was morally conceived, most of it not. However the people of the United States of America rejoiced with the rest of the world, as they understood the progress this represented. With the small bit of dignity gleaned by the government of South Africa on the world stage many seeds of justice were planted. 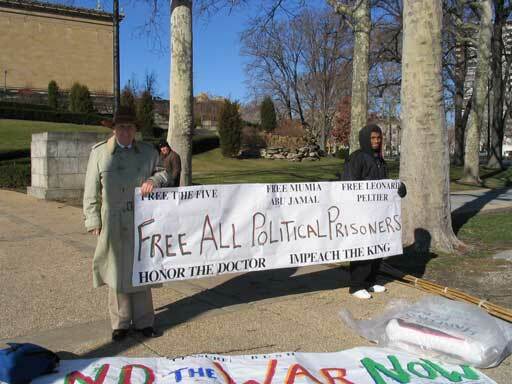 Courage, respect, legitimacy, derived from the release of a political prisoner. There is a case of a political nature that is rubbing on the conscience of our nation today. In the midst of the War on Terror we are imprisoning Five fighters against terrorism. Their trial and their treatment in detention have been overtly political. 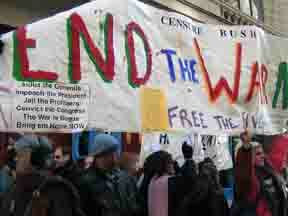 Our media have censored their plight. On the anniversary of the release of Nelson Mandela it would be appropriate for our government to release these political prisoners. Click here for a PDF Book about Cuba, the Heroes and Angola! 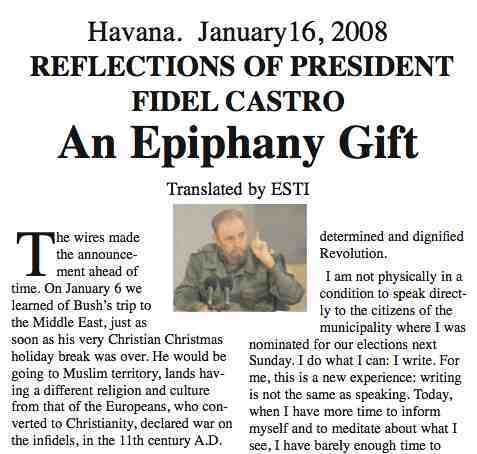 I will start out by stating a little background information about the five and Cuba. 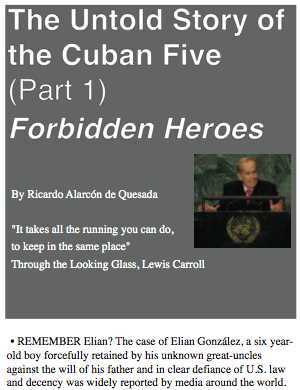 The Cuban Five are five cubans that came into this country for the purpose of gathering information about activities by members of the Cuban exile community based in Miami. These Cuban exiles have been terrorizing the shores of Cuba ever since they came to America. For decades, missions were carried out that included dropping poison on crops, machine-gunning beaches, and blowing up hotels and planes. The five Cubans were sent by the Cuban government to the US to infiltrate the different organizations that were committing these terrorist acts and report to the Cuban government any information about planned attacks. 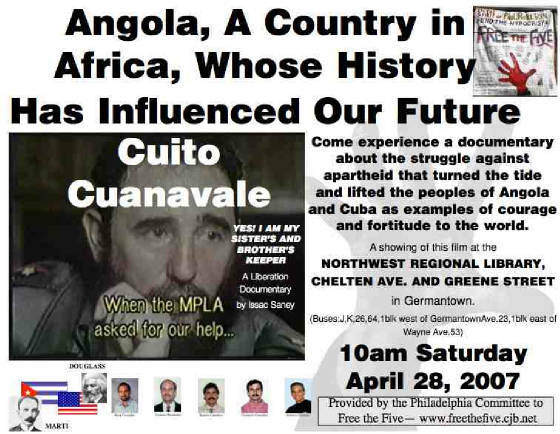 Then in 1996 three planes from one of these exile groups in Miami were flew to Cuba s part of an anti-Fidel campaign. The Cuban government was informed of this and when the planes came near the government contacted them telling them that they were flying into Cuban military air space and they must turn back or face being shot down. One of the planes turned back and two kept going and were shot down. As a result of this the five Cubans in Miami were arrested under charges of conspiracy to commit espionage and failing to report that they were working as agents for the Cuban government. Even though none of the accused had had any access to secret information or committed any violent crimes, they were convicted. Three of them were given life sentences and the other two got 15 and 19 years respectively. 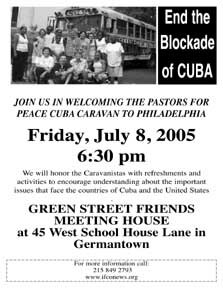 In the summer of 2000 I went to cuba for the first time with my brother and my father with Pastors for Peace, a group that takes a caravan through the US collecting supplies for the Cuban people in an effort to openly break the blockade imposed on Cuba. 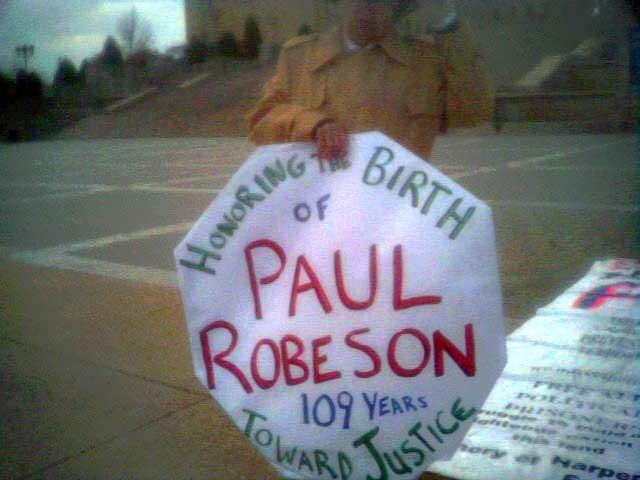 It was there that I was informed of this unjust act, as well as their unfair treatment in prison. When I returned to the States I took it upon myself to learn as much as I could about the five and their situation. 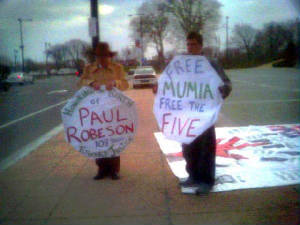 During some research it was discovered that one of the five was remotely close, in fact he was imprisoned here in Pennsylvania. His name is René Gonzalez and we decided to send him a letter stating our solidarity with him and his comrades. He responded and after various letters back and forth, it was decided that we go visit with him. In preparing to go to this jail and take in this new and different experience I had to ask myself what kind of conversation would I be taking up with this person. It was something that made me anxious but upon meeting with René in person I noticed a friendly atmosphere right away. Until that moment in time I had always felt a sense of concern for the information I had received from my dad or the internet, because with history you can never know when something is biased or not until you see it for yourself. 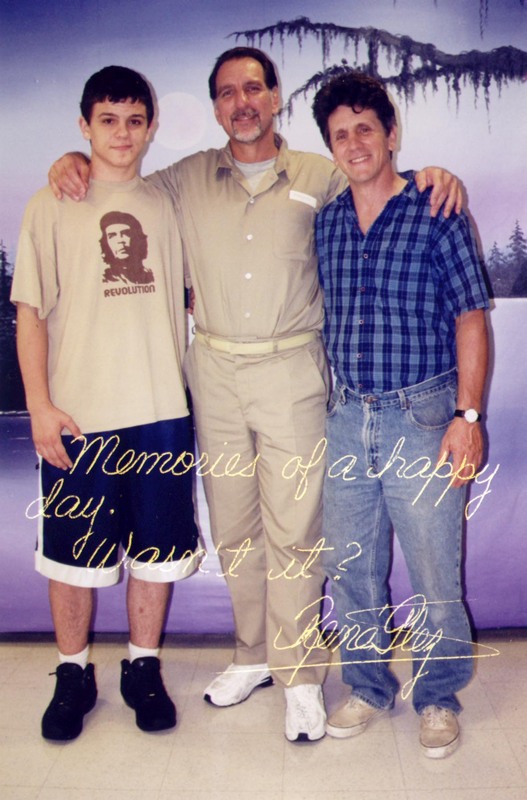 And when my family and I finally sat down and talked with René it was more then evident that the crimes of which he is charged are unfounded and outrageous. Almost everything I read about the five not using violence and acting in a most respectful way was, in my eyes, true. That made me feel great! And at the same time it made me feel ashamed because it was my country that imprisoned him and his comrades so disrespectfully. Since that time I have traveled to many different events and places expressing my solidarity with the Cuban five and also emphasizing the fact that these guys need to be freed now. 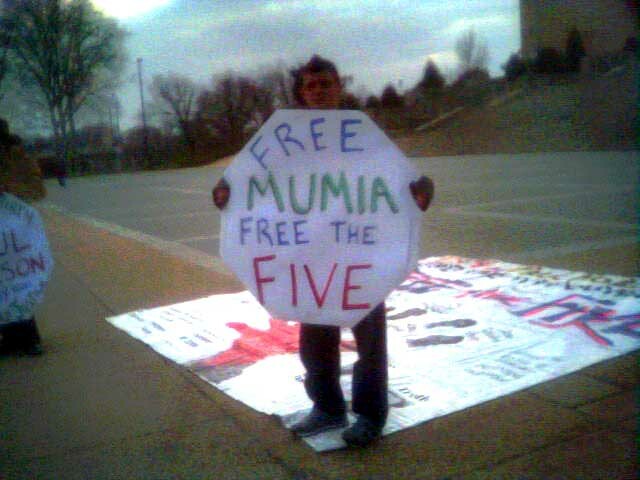 I have marched in demonstrations with a 14 ft sign that reads FREE THE FIVE while hard cold winds try relentlessly to push me down but I keep going. I keep going because it is something I feel needs to be done. If I had known about this injustice and did nothing about it I would be unable to feel at peace with myself in a way. Some things in this world can not be overlooked, and this is one of them. Last summer I had the opportunity to go and revisit the small country of Cuba with a youth exchange program. It was extremely exciting for me because through this program I would have the opportunity to visit and meet with the relatives of the Five. So I went, and learned so much about how life is for people who are not disrespected all the time and how anybody who needs to see a doctor gets to see a doctor right away free of charge. I felt as if I had been given a large book of knowledge and told to absorb as much of it as possible so to better yourself in life, and for me that is a feeling that does not come about as often as one would want and that gave me confidence. Then towards the end of the trip it was finally announced that we would get to go see the relatives of the Five. At that time I felt the same sense of anxiety that I felt the first time I went to see René. This scared me a bit but not for very long because as soon as it was made know that I had come in contact with René I was treated as royalty. I was interviewed for the paper, the tv, and for an independent journal. I was allowed to personally go talk with the relatives and to talk briefly with the prime minister of Cuba, Ricardo Alarcon. In all, this entire ordeal has given me more light and opened more doors then I ever thought possible, and as a kid from Germantown, who attends Germantown Friends School I experienced for the first time a sense of my own significance as a human being who can contribute to important affairs of the world. Until she spoke, the slave trade was sanctioned by all the Christian nations of the world, and our land of liberty and light included. Men made fortunes by this infernal traffic, and were esteemed as good Christians, and the standing types and representations of the Savior of the World. Until Haiti spoke, the church was silent, and the pulpit was dumb. Slave-traders lived and slave-traders died. Funeral sermons were preached over them, and of them it was said that they died in the triumphs of the Christian faith and went to heaven among the just.